Are you interested in teaching Pilates with us? Clinic 88 Pilates in Macquarie ACT are looking for experienced and passionate Pilates instructors to join our team! Mat Pilates class instructor Monday nights 6-8pm for existing client base. Start ASAP. Studio Pilates instructor Experience working with injuries. Hours flexible. 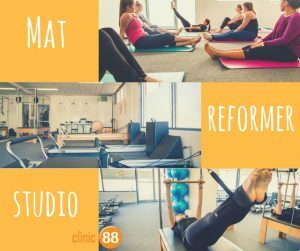 The Clinic 88 studio is part of a group of manual therapy clinics specialising in Soft Tissue Therapy and Exercise Physiology. Staff across all locations are encouraged to attend our weekly tutorial aimed towards further developing understanding of anatomy, increasing professional knowledge and problem solving. Due to our focus in rehabilitation and referral from the main clinic, this role would suit someone currently studying or with additional background in sports science, human anatomy, massage therapy, physiotherapy etc. Hold current indemnity insurance and first aid+ CPR certificates. Our studio comprises a mixture of studio sessions, mat and reformer classes. Our priority is to fill the existing Mat classes Monday evenings 6-8pm. We would love to discuss other flexible opportunities to build your own client base in mat or studio at suitable times. For further information or to apply for this role, please email your resume and a brief cover letter outlining relevant skills and experience to nicole.punch@clinic88.com.au or call 0437 584 832.